Mormon Truth!! : Mormon Truth Is Now Accepting Donations, In Order To Allow Me To Dedicate Myself 100%, To Helping People Leave Mormonism And Recover!! Mormon Truth Is Now Accepting Donations, In Order To Allow Me To Dedicate Myself 100%, To Helping People Leave Mormonism And Recover!! Well everyone, I first want to say, thanks again for all of your support and loyalty, over the last 8 months. I think all in all, what I've been able to accomplish has been a great success and the people that I've been able to help, has been a tremendous reward for my efforts. I never dreamed that I would have been able to help so many people in such a short period of time. However, without all of the support and Emails, that I've received from all of you out there, especially those of you that have personally shared how I've helped you; I wouldn't have been able to do any of this. I want to be able to continue doing what I have been doing on nothing less than a full-time basis and helping as many people as possible. I simply don't know how else to do this, but with everything I've got, as I rarely do anything half-way. To spread the truth about the Mormon Church and it's fraud, while helping as many as I can, was never intended, on my part, to be a full-time experience. However, it has turned into that, through the sheer necessity that exists out there, and the amount of people that are searching for truth and suffering. When somebody, especially a long-time or life-long Mormon, leaves the Church, there is no way to measure the amount of spiritual, psychological and emotional anguish that they suffer through. How do you measure the amount of pain associated with leaving the Mormon Church and losing best friends and loved ones from your life, because of your disbelief and the fact that they, those that you have lost, choose the Mormon Church over you. It's simply devastating and I know through personal experience. I could literally spend all day, everyday, just answering all of your Emails, if I didn't do one other thing. I, of course can't do that, as I have additional studying and research to do, experiences to read, blog posts to write and podcasts to record. I also need time to sleep and do my own personal family stuff. I guess that I've always been the type of person, that can't walk away from somebody that needs help or advice and this is no different. So, what it has come down to, is that I need your help through donations, to be able to continue helping people at a high level, like I have been doing. This is not something that I've wanted to do, but I've done all that I can, to get to this point and now I need my supporters to help me continue forward on this journey. For me, it started out as a journey to the truth, mostly for myself, and it soon evolved into helping myself, while helping others, including my immediate Family, Friends and then others that requested my help. It all started for me back in June or July, posting my opinions on chat boards, that were heavily moderated and censored. That led to great frustration and the creation of this blog, Mormon Truth, about 8 months ago, where I wasn't censored and could freely express my opinions, without feeling that I was still in the Mormon Church. Nothing worse than feeling like you have a "new freedom of expression" and then once again, have it taken away from you. Then, through the examples of Mike and Hyrum, at the Church is not true and John Dehlin, I decided that I needed to start my own podcast, which was right around 3 months ago. That was when the Email really started to pour in, asking for help, information, etc. I never expected the response that I've received, as once again, I was simply trying to help others, while helping myself at the same time. So, it has been a journey and I've done all that I can, with plenty of personal things happening along the way, with deaths in the family, along with several of my close friends and Family, that might as well be dead, because they will no longer talk to me, due to my disbelief in Mormonism. By the way, NONE of them even know that I'm doing any of this; my blog, podcast, etc. Their decision to no longer associate with me, is just based on very basic discussions we've had regarding the Church and my issues with Racism, Polygamy, etc. Believe me, I've kept it pretty simple and basic with these folks and even expressed that I just wanted to understand, etc. Imagine if they actually knew to what extent I don't believe, and that I've been actively fighting against the Church, to prevent conversion and cause de-conversions? Yeah, it would really get ugly then!! They've already called me a Son of perdition, told me that Satan is deceiving me, and that I'm one of the elect in the last days, that is being deceived, just as it was prophesied to happen. They tell me that, "they are praying for my soul." I let them know that I'm also praying for them, which they don't appreciate, especially since I'm now a very evil man that the Mormon God would never listen to. Anyway, I feel very strongly, that I really need to be doing this on a full-time basis and be 100% dedicated to this cause, and all of this, has been an unexpected change in my journey of life, to say the least. But, the only way I can do that, that is to dedicate myself 100%, is with your help. I greatly appreciate anyone that is able to help me to accomplish these things and donate to "MORMON TRUTH", but I also wanted to be able to do something for you in return. So, what I've done, is team up with a great guy, who strongly supports what I'm doing and wants to help me in this great cause. 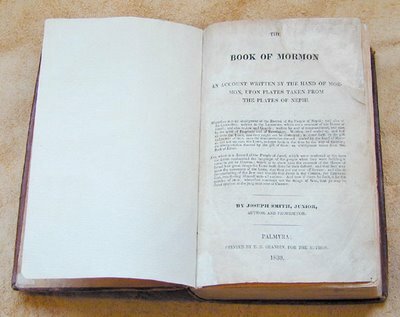 He has generously offered to donate 1830 Book of Mormon E-books, on CD-ROM, to anyone that donates $25 or more. He has spent countless hours, putting these together and came to me, offering to help me out, by giving each of you a gift for your support. I greatly appreciate his efforts and willingness to help further this cause and this mission that I'm now on. He has put together an amazing thing that will help all of us. What he has done, is to scan every single page, from the original 1830 Book of Mormon, onto a CD-ROM and it is awesome!! Now, back then, there were no verses, so what he has done, is match-up the text from back then, with the current verses of today, to make it very easy to compare what was written originally, to what is written today. This will be a great gift for anyone out there that wants to do these comparisons, to be able to see, for yourself, all of the changes that have taken place in The Book of Mormon, since 1830, which is nearly 4,000. The text is large and easy to read and by having it on disk, you can take it with you wherever you go, if you want to show it to friends, families and others who don't believe these claims and chalk them up to nothing more than anti-Mormon rhetoric. This man, who is helping me out, wishes to remain anonymous, but has agreed to offer this E-Book of Mormon for a month and then we'll have something else great, to offer everyone who donates. So, once again, I say thanks to all of you, that have been of so much support over the last 8 months and counting. I'm truly grateful for those of you out there, that enjoy my blog and podcasts and especially those of you that I've been able to help in any way. For those that are able to donate and help me in this cause, thank you so much, as I'm sure many people will be grateful. I never realized how much pain there is out there, that is being lived everyday, by former members of this Mormon cult, including myself. I can't do everything, as I still have a ton of Email to get to, but I assure you and I promise all of you out there, that I will do everything I can and try as hard as I can, everyday, to keep the truth rolling forward and help as many people as possible. Also, today I'm releasing a 2 part interview, that I did with Eric, from "Living Truth Podcast" that I think you guys will really enjoy. I discuss, more in depth, many of the reasons why I left the Church and I chronicle my journey to the truth. We talk about a lot of different subjects and I share many experiences that I had while on my mission in Argentina. I also realize now, that I'm not in this for the short-term, because there are too many people that need help and support and that number will just keep growing, since at any given time, the Mormon Church, has around 50,000 missionaries out in the world, trying to convert and indoctrinate even more people into their fraud, through their outright lies, manipulations and half-truths. I want to mention, that most of these missionaries out there doing this, just like I was, are innocent victims of the brainwashing and indoctrination, that are just being used by the Mormon Hierarchy, to perpetuate their fraud. We need as many people as possible, fighting for truth, justice and honesty while reaching out to these people, that currently need our help and those that will need our help in the future. Hey just wondering how to get the 1830 BOM cd.... I've got my $25 bones so e-mail me back!